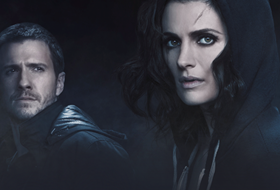 Castle ended season three with a (literal) bang and has continued to deliver knock-out episodes for the last eight weeks as the ABC drama’s fourth season has unfolded. Tonight delivers another stunning episode — one that turns the spotlight back on Castle & Beckett’s relationship, her mother’s murder and the emotional stunting that’s cropped up a result of the aforementioned season finale shooting. The combination of those three elements, as well as the tightest Case of the Week thus far, results in an emotionally resonant episode that lets Stana Katic shine like never before. ETonline recently caught up with the actress to talk all about tonight’s can’t miss episode, what it means for Beckett moving forward and when fans might finally see this dreamy duo dating! ETonline: Fans have been loving this season, what are your thoughts about it? Stana Katic: I think this year we’ve really found the groove – we know the procedural element of it, but we’ve really explored the character side of the stories more than ever this year. That, as an actor, is the most satisfying experience. ETonline: With the bank hostage story and Castle’s declaration of love, it also seems like the relationship storyline is moving along nicely. Katic: Yes, I agree — and I love it. I feel that those two characters are really meant for each other and really deserve the lovestory that our show is promising. It’s sweet to watch two people really care for each other and work to help each other live a better life together. ETonline: And while I appreciate that the show isn’t jumping the gun on putting them together, how much longer do you think the show can go without putting them together? Katic: I think when a show is guided by the characters, there comes a point when they can’t be apart. The continual development of the characters will lead us in that direction. I think there are a few things we still have to work out before we get there, but I don’t see us running the full length of the show with Castle and Beckett apart. I see them coming together and us experiencing them and a couple and all the complications that come from being a new couple. ETonline: Will we see either pick up and start dating someone else, as they’ve done in the past, or will their next relationships be with each other? 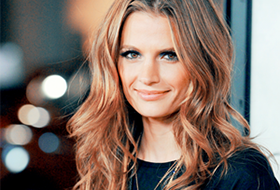 Katic: I think the blockade this year is the theme of the year – everyone has secrets. In Beckett’s case, the secret is that she knows Castle said he loves her. She loves him, but she also knows that she’s got this severe block. She knows that she can’t dive into a relationship because she needs to solve the murder of her mother. That’s kept her halfway in and halfway out of every relationship her whole life. Castle, on the other hand, has been holding her back from solving that case because he knows someone out there is going to make sure if she does go down that rabbit hole again, she won’t survive it. They both have secrets that are aimed at helping build a great relationship and a great future together, they just don’t realize they’re working at cross purposes right now. ETonline: Beckett has also had lots of breakthroughs in therapy — as an actor, how great has it been to have those scenes this year? Katic: She’s the other half of the romance and to know her inner-workings is so important. Sometimes Beckett is such a mystery we don’t know why she does some of the things she does. I think the therapist, and hopefully the additional storylines we develop with the other characters, will open up more of the inner workings of her and why she’s made some of the choices she has. I think Beckett is a beautiful character, full of integrity and she’s trying her best. ETonline: What excites you about tonight’s episode, Kill Shot? Katic: It’s a special piece to me for two reasons – Beckett is a flawed hero, she doesn’t always make the best choices, but she’s trying. One of the choices she’s made is to commit herself to justice and to resolving her mom’s murder. In life people create these commitments, these allegiances because of their community or experiences in life, but sometimes we get so tied to those allegiances that we start compromising our own life. And I think this is a really big wake up call for her. She realizes that she’s set up these roadblocks and defined herself by that experience without even knowing it. Now she starts to think, “Maybe I don’t want to define myself by that anymore … maybe I want to actually live life … maybe I want to experience all this wonderful potential that’s set in front of me.” Like a relationship with Castle. It’s a beautiful self-realization for her and something we’re finally getting to experience with this character.